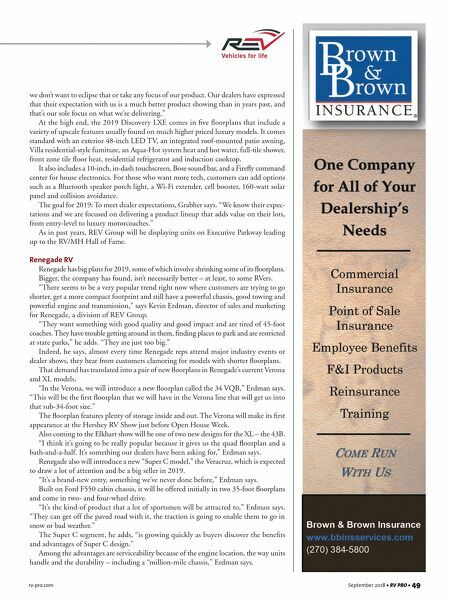 48 • RV PRO • September 2018 rv-pro.com REV GROUP REV Group plans to hit Elkhart Open House Week with products that run from Lance's travel trailers to Fleetwood's high-end Discovery LXE – a lineup company officials are calling "the best we've had in years." "For Open House, REV Group is proud to showcase all of our brands in one display," says Bethany Grabher, REV Group marketing director. "We cover the entire market, from indus- try-leading truck campers from Lance Camper to the most beautiful Class A luxury diesel units from American Coach." Most notable, she says, will be: • The entry-level Class A gas models from Fleetwood RV and Holiday Rambler – the Flair and Admiral. • Reintroduction of retooled Class C units: The Fleet- wood RV Pulse and the Holiday Rambler Prodigy. The 2019 Flair and Rambler Admiral – each with five floor- plans – feature changes geared to attract first-timers in the top- selling Class A motorhome segment. Grabher says the Flair, for instance, includes features usually more likely to be found on higher-end level Class A's, such as the king bed, Hide-A-Loft drop-down queen bed, ducted air conditioning, residential refrigerators on select models, modern cabinetry, and auto generator star. It also comes with a 50-amp service, heated holding tanks and pass-thru storage. There are plenty of options, including theater seating, suspension upgrade and power driver seat. The Fleetwood RV Pulse and Holiday Rambler Prodigy also have been redesigned for 2019. 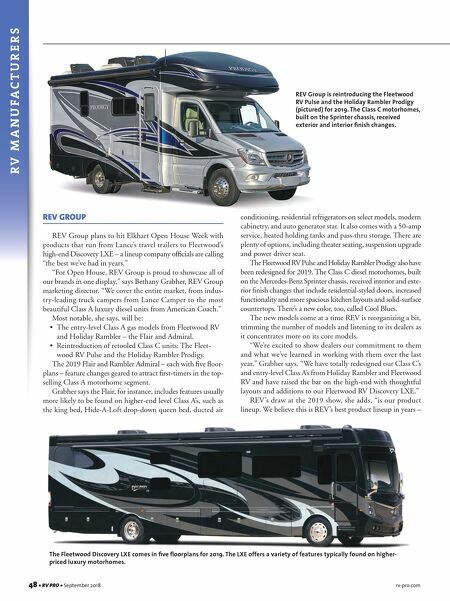 The Class C diesel motorhomes, built on the Mercedes-Benz Sprinter chassis, received interior and exte- rior finish changes that include residential-styled doors, increased functionality and more spacious kitchen layouts and solid-surface countertops. There's a new color, too, called Cool Blues. The new models come at a time REV is reorganizing a bit, trimming the number of models and listening to its dealers as it concentrates more on its core models. "We're excited to show dealers our commitment to them and what we've learned in working with them over the last year," Grabher says. "We have totally redesigned our Class C's and entry-level Class A's from Holiday Rambler and Fleetwood RV and have raised the bar on the high-end with thoughtful layouts and additions to our Fleetwood RV Discovery LXE." REV's draw at the 2019 show, she adds, "is our product lineup. We believe this is REV's best product lineup in years – R V M A N U F A C T U R E R S REV Group is reintroducing the Fleetwood RV Pulse and the Holiday Rambler Prodigy (pictured) for 2019. The Class C motorhomes, built on the Sprinter chassis, received exterior and interior finish changes. The Fleetwood Discovery LXE comes in five floorplans for 2019. The LXE offers a variety of features typically found on higher- priced luxury motorhomes.